A beautifully crafted rustic wood bookcase from our Mexican dark stain collection. Features include made from 100% distressed pine wood to give it the old world look, and a lacquer seal to give it the modern feel. This bookcase features three fixed shelves, curved decorative panels and two small bottom drawers for additional storage. 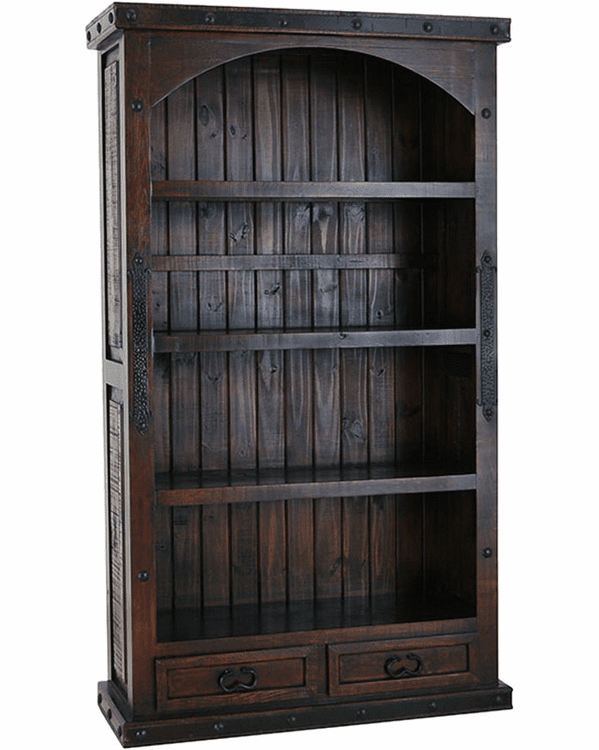 Decorative metal band with clovas or nail heads around the top side edge and bottom edge of the bookcase enhances its rustic old world charm. All drawers have metal drawer glides ensure smooth opening and closing of the drawer. Relief panels highlight the sides of the bookcase and wrought iron forged hardware adds to rustic charm. Comes already assembled.